If you are traveling in the Netherlands, you are lucky. It sports one of the best, most modern, and most reliable public transportation systems in the world. The Netherlands prides itself in being innovative and modern in its transportation offerings. And of course, you will notice that most people use a bike to get around for at least part of their journey! Trains: In general, trains are used for longer rides, but there are trains, the express and local, that stop more locally. When you buy your ticket, you can choose between first and second class, although not all trains will allow you to make reservations for the kind of seat you want. The great thing about trains here is that all stations are located exactly where you would want to go; work, museums, restaurants etc. It is all planned out very meticulously. 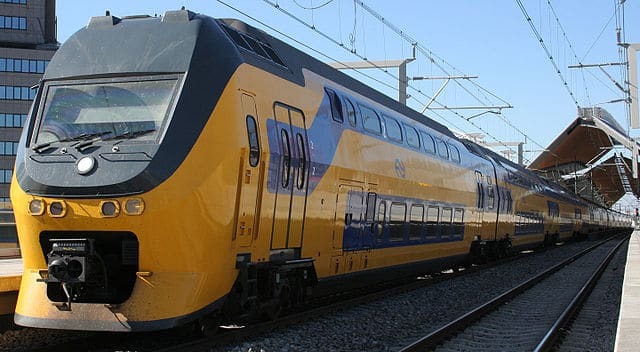 Fast Trains: There are two of these in the Netherlands; the Fyra and NS Hispeed. These travel from Rotterdam to the Amsterdam Airport, Schiphol or Amsterdam in about 40 minutes. These trains allow you to make reservations, so you do not have to stress about standing the whole time. Night Trains: These run every hour of each night of the week. The route is between Rotterdam Central, The Hague Hollands Spoor, Leiden Central, Amsterdam Airport Schiphol, Amsterdam Central and Utrecht. To see a map of these routes, click here. The Netherlands also has busses, trams and metros services. But for information about this, you have to look at the city you will be in. Metro: There are four metro routes in Amsterdam and 52 metro stations. So it is very likely that wherever you want to go, the Metro can get you there. Recently, the Netherlands replaced all metro cars with new ones, so it is even more Euro hip! Tram: The tram network in Amsterdam is also comprehensive and can take you almost anywhere. These vehicles can seat more people than a bus, and better, they generate no exhaust or particulates in the air. Bus: Amsterdam has all kinds of busses from regular busses to the kind that are joined together with an accordion like joint (this are called articulated busses). They also have midi busses, busses that are smaller than a standard bus. Most bus routes in Amsterdam go from north the center and out to the suburbs. Of course, you can get connections to the tram and metro networks as well. Metro: Amsterdam has 4 colored metro lines. Three of the routes go from the Central station out to Gaasperpas, Gein and Westwijk. The last goes from Gein to Isolatorweg. If you are planning on visiting the Netherlands, you will not have a problem getting around. You will notice that most people ride their bike to the stations, or to their destination. The Netherlands is super easy to get around in whether you are there on business or pleasure. @2018 - www.netherlands-tourism.com. All Right Reserved.